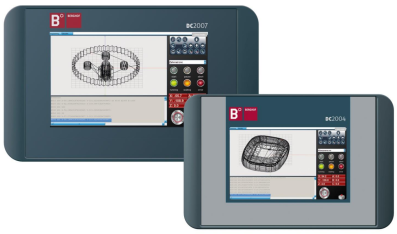 Berghof following the industrial trends builds the a dialog controller with CODESYS runtime, combining PLC power and HMI touch monitor. DC series are PC architecture controllers with open source real time OS and CODESYS tuntime. The plc-monitor combination together with I/O expandability makes DC controllers a very powerful tool. Decentralized architectures can be realized due to the vast number of communication ports available. With the SD slot, controller’s data storage is expandable to GB sizes. Some more characteristics of the controller are USB host, Ethernet, CANbus, RS232 and RS485, FTP server, Http server for web visualization and parametrization. DC controllers are available in monitors sizes of 4”,7”, and 10”. The same controller is offered also without monitor but with I/Os in a form of PLC. With webinterface we can create costless, interfaces seen from any browser (PC, smartphone or tablet).